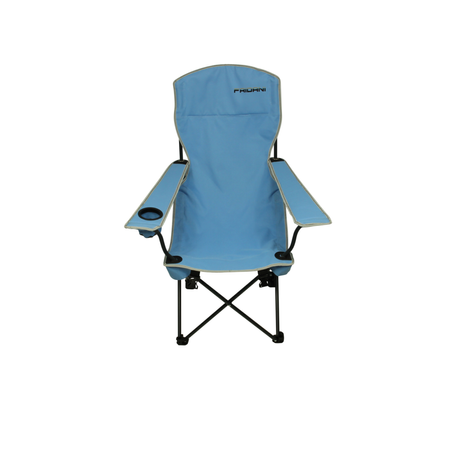 Buy Fridani FRB 105 - camping chair with footrest, foldable, incl. bag, 4200g from Fridani at Camping Outdoor online. 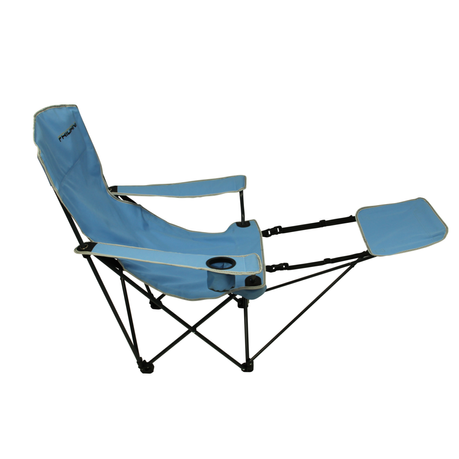 Whether camping, fishing, in the garden, on your picnic outing, at your local football club or the next festival party - this chair is your perfect mobile seat for almost any outdoor activity. 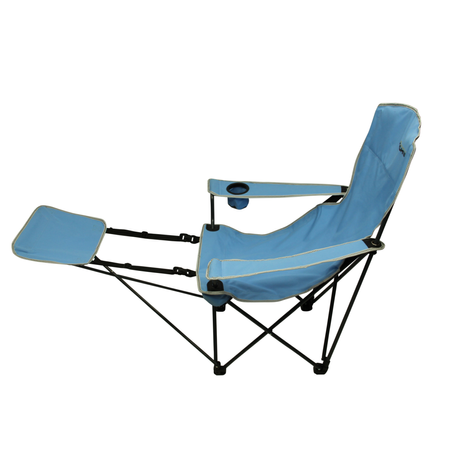 The camping chair has an ideal sitting height to sit comfortably at the camping or garden table. 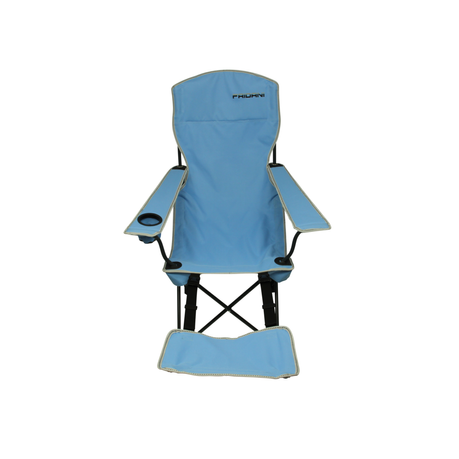 The seat and backrest are made of robust material and offer maximum seating comfort. 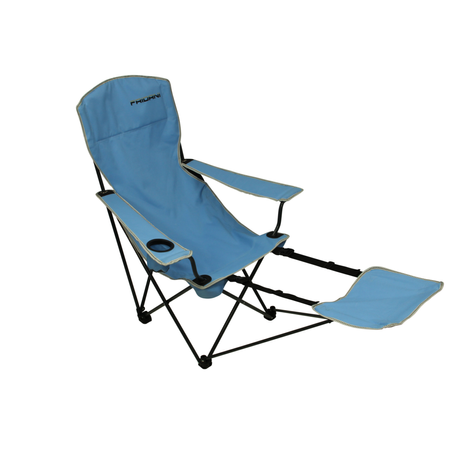 The chair can be used individually with or without footrest. The assembly is very easy due to the plug-in system, with the help of 2 straps the height of the shelf can be adjusted steeply or flat. The height of the armrests can be variably adjusted on the rear linkage. 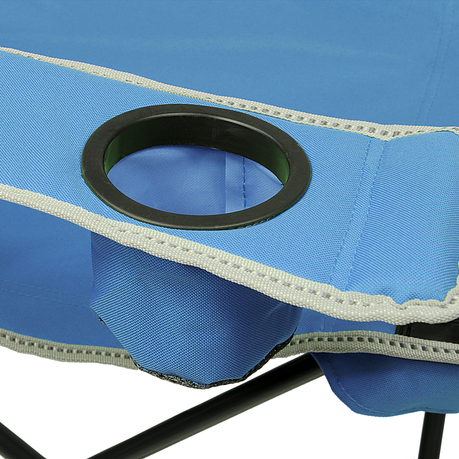 The right armrest is equipped with a cup holder, in which you can put a beverage can or a glass, while you stay with friends and family around the campfire. 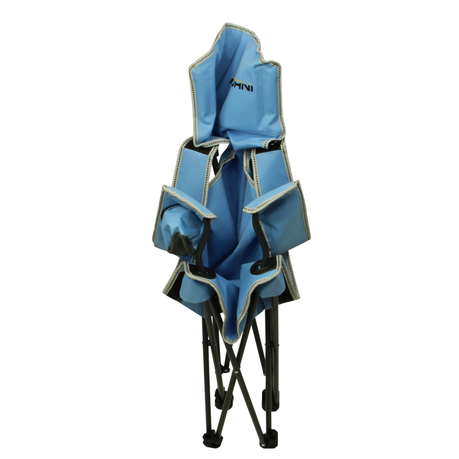 For transport or storage, the chair is folded up in a space-saving way and stowed away in the top-loader transport bag with drawstring. Due to the low weight, even children can carry this chair. 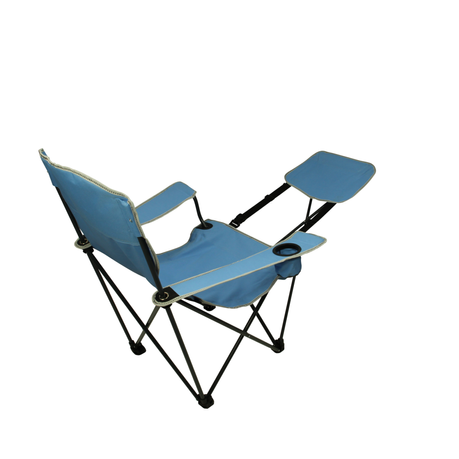 The basic frame for this folding chair is formed by the lacquered tubular steel poles. This is set up in a matter of seconds and just as easily and quickly folded up again. The struts of the footrest are made of the same material. 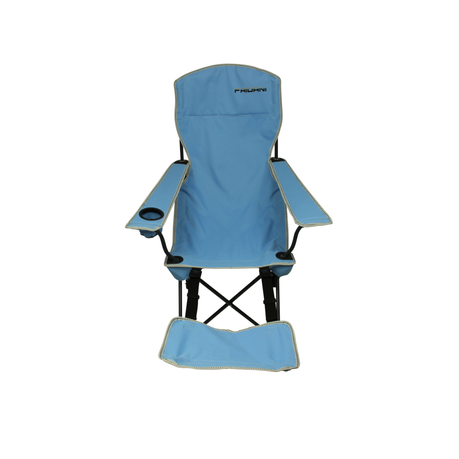 Due to the load-bearing capacity of the frame construction, even heavier people can easily take a seat. 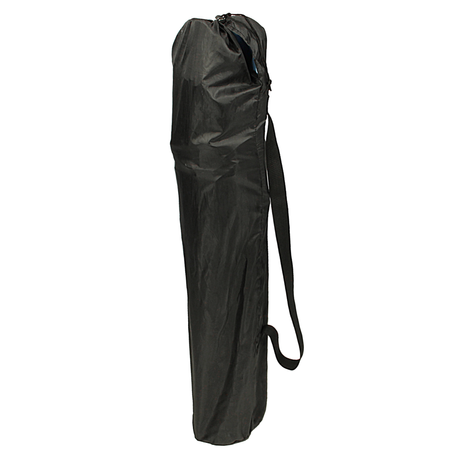 The cover is made of robust and easy to clean polyester material. This was bordered with a textile tape. The upholstery fabric was sewn with sturdy double seams. A double seam provides the best hold under load. Four large plate feet ensure the best stability on almost any surface. The feet are made of solid plastic and the front feet are also a fixing point for the footrest. In addition, all stress points are equipped with a flexible plastic frame to prevent damage during loading. Infinite applications! 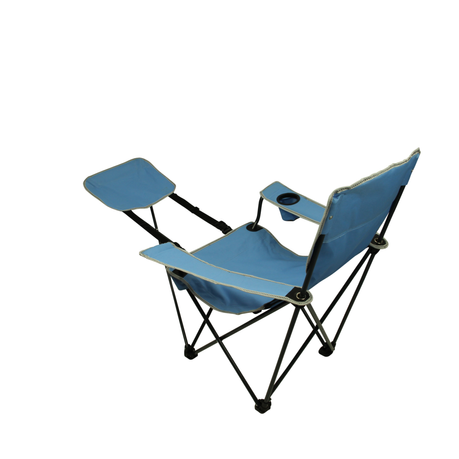 As a garden chair, camping chair, fishing chair, terrace chair, mobile seating for travelling, folding chair on the balcony or even as a dining room chair when the house is full. Without the footrest, the chair can be used on all tables with standard height. 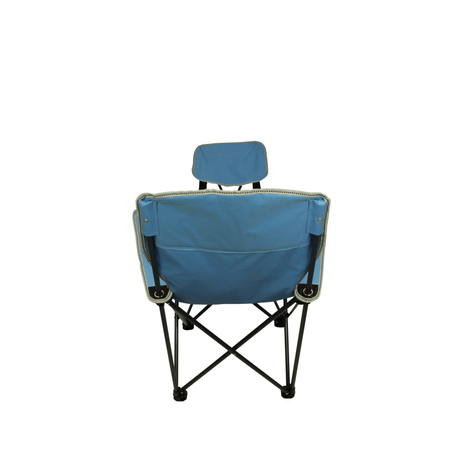 In order to ensure a long service life and durability of the folding chair, all stress points are reinforced and protected against tearing with a soft plastic edging. The installation of the footrest is simple and done within seconds. The struts are simply inserted into the foot of the chair by means of a pin. 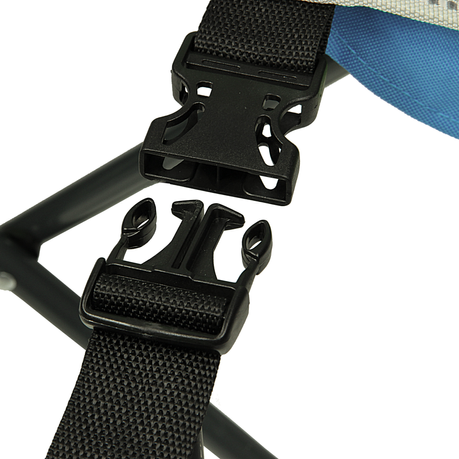 A strap with clips then connects the support surface directly to the seat. The length of the connecting strap is variable, this regulates the angle of the footrest: short=part & long=flat. In the cup holder on the right-hand side you can safely place a cup, can or bottle. Thanks to the upholstery fabric and the round plastic edging, it is also robust and stable. The transport bag is a top loader packing bag. 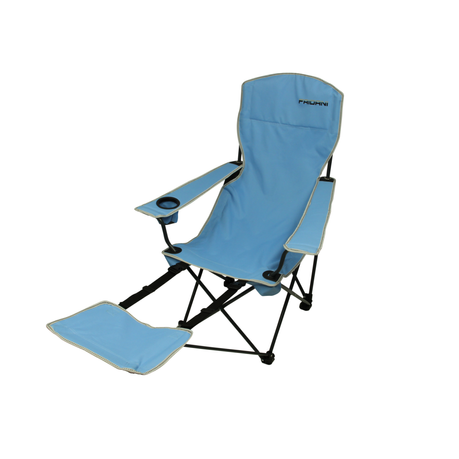 The chair and footrest are pushed in from above and the bag can be closed with a drawstring. A comfortable shoulder strap for easy transport. 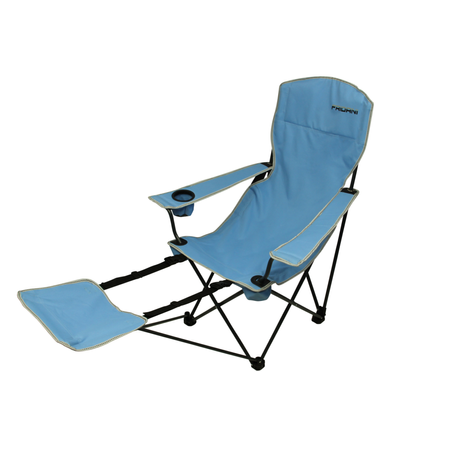 Mobile chair for camping, festival, garden, terrace, balcony, picnic, party, fishing or sporting events. A companion for young and old, adults and children on holiday and in leisure time.